A comedy and drama about an unlikely friendship late in life, The Bucket List is better than its seemingly flimsy premise may suggest. 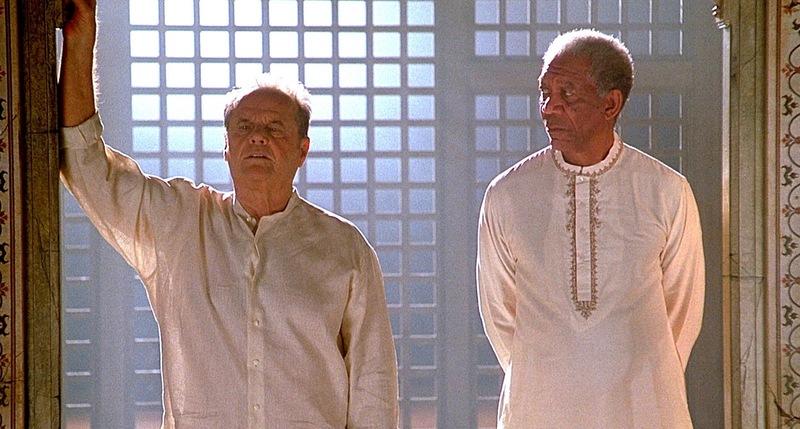 Edward Cole (Jack Nicholson) is a surly and extremely wealthy hospital tycoon. 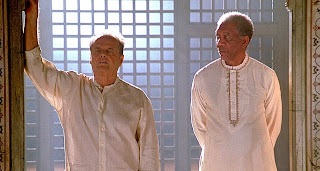 Carter Chambers (Morgan Freeman) is a kindly but well-read mechanic. The two men end up in adjacent hospital beds, both battling cancer and undergoing chemotherapy treatment. Their relationship gets off to a rocky start but gradually the two men warm up to each other. When they are both given only months to live, Edward and Carter create a bucket list of things they want to do before they die. They embark together on a trip of a lifetime to knock off as many items as they can, including skydiving, car racing and a trip to the pyramids, with help from Edward's assistant Thomas (Sean Hayes). Carter's wife Virginia (Beverly Todd) deeply resents her husband taking off with a new friend when he has a limited amount of remaining time to spend with family. As Edward and Carter travel the world together, they form a deep bond and broach painful topics, including religion, family and their deepest regrets. Movies about genuine friendships between men rarely strike the requisite chords, and often veer towards either mindless brohood or grim and stoic mutual respect. 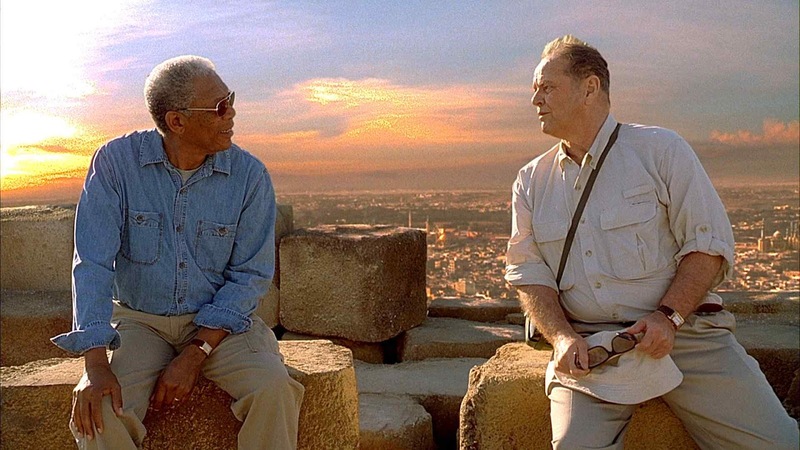 Here two veteran actors in Morgan Freeman and Jack Nicholson working with astute director Rob Reiner and a Justin Zackham script take on an often awkward topic, and pull it off with surprising ease. Mixing mild comedy with increasing levels of serious discourse, The Bucket List wanders into territory where men are at their most vulnerable: saying sorry, admitting mistakes, debating core beliefs and leaving no regrets behind. Family man Carter has to face being selfish to pursue his bucket list despite his wife unspooling a professional guilt drama. Hard nosed Edward has to come to terms with what it means to actually care about someone beyond making money off perfunctory health care facilities. These are heavy emotional rocks for men to turn over, and the premise of death knocking firmly on the door of life allows Edward and Carter to literally and figuratively go to places they would have otherwise never ventured near. Reiner steps back and allows his two stars to shine, only infrequently falling into mundane travelogue moments (the Great Wall) or unfunny farce (at the racetrack). Otherwise he ensures that Edward and Carter build up their characters gradually, the men naturally revealing more of their psyches to each other as the trip progresses and the end nears in under 100 minutes. Nicholson plays a slightly toned down version of his typical outspoken devil-may-care persona, with Freeman a perfect foil as the thoughtful blue collar worker, full of trivia, worldly belief and calm resignation. The Bucket List is funny and melancholy, two superstar actors effortlessly teaming up to write a final chapter.